Do you remember Glorious Green? That was a color SU had waaaay back when I first started with SU (hint…started in 1999…LONG time ago!). Anyway, as I was building up supplies I bought a pack of that paper. When SU retired that color…I STILL had some of that pack left. Yep…THAT wasn’t a favorite color either! I did find though, I could ‘tone it down’ with grey so that is what I did to make Cucumber Crush to make it work for me! Cucumber Crush print (Cherry on the Top dsp) – three strips 1 1/8 x 3 3/8. Round the top corners of one and the bottom corners of the other and add to card front using dimensionals. Add 3 large silver Basic Metal Buttons – one to each strip. Whisper White – 2 3/4 x 3. Stamp ‘foot prints’/Cucumber Crush, greeting/Memento Black, one dinosaur Smoky Slate/Memento Black, the other dinosaur Cucumber Crush/Memento Black. Cut our the dinosaurs and add using dimensionals. Wrap around the Smoky Slate Thick around panel then add to card front using dimensionals. 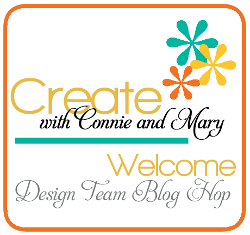 This entry was posted in Create with Connie and Mary, Saturday Blog Hop and tagged No Bones About It. Bookmark the permalink. I think Cucumber Crush is WAAAY better than Glorious Green! I couldn’t do anything with that color!! 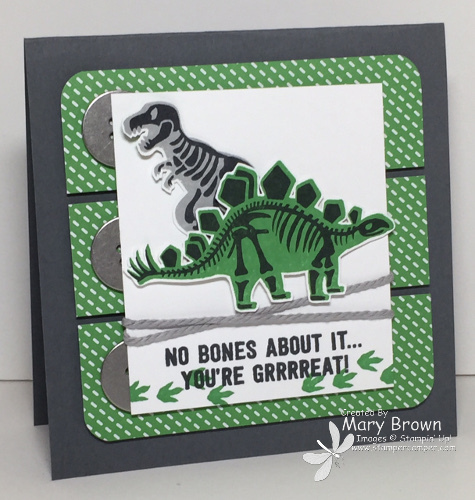 Love your CC project-it’s a good color for dinosaurs!!! I love Cucumber Crush! Great card. I remember Glorious Green! started stamping in 1997 so I remember a lot of the older colors. Do you remember when they had Ancient Page ink pads in SU colors? I wasn’t stamping at that time but one of my stamping friends had an Ancient Page pad in Forest Foliage…now THAT was an awesome green!